Get your free copy of Outsource or Else! Outsource or Else! is the critically acclaimed technology management fable written by Accelerance founders, Steve Mezak and Andy Hilliard. The book provides an entertaining, yet realistic look at the common concerns and pitfalls that companies face when navigating the risks and rewards of software development outsourcing. 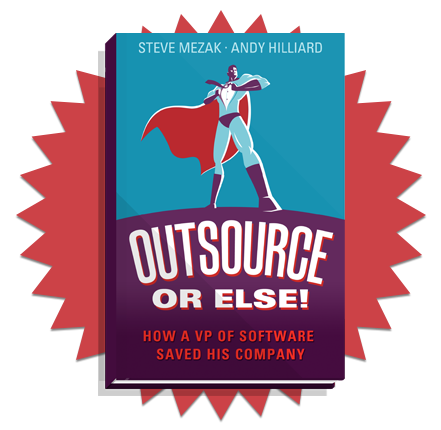 “If you think of outsourcing or even if you already outsource read this book. An easy, relatable read on a quite intimidating topic. This book walks the reader through what is typically a daunting process with great insight, in a quite entertaining manor. Sprinkled with both humor and reality, this book really drives home not only the importance of outsourcing, but actionable steps to ensure a successful outsourced project.